Foreword. Preface. Acknowledgements. 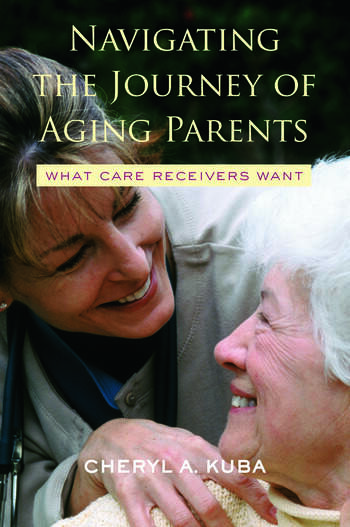 Care Receivers - An Intimate Profile. Start the Conversation. Take Care of Yourself First. Growing Old and Feeling Ill - A Permanent Condition? Getting Up Close and Personal. Driving Through the Fog. 'Give Me the Keys'. Leaving Home. Destination Your House. A Million Miles Away - Receiving Care from a Distance. Circling the Wagons. Where is the Love? What About God? Is He Still Listening to Me at this Age? The End of the Road: Death as Life's Final Chapter. Cheryl A. Kuba holds an M.A. in Gerontology, is the founder of Aging Parent Solutions, (LLC), and is a member of the National Speaker Association. She is the former Executive Director of the Ivy Retirement Community, regional marketing director for Brookdale Senior Living Communities, and director of public relations for the Illinois Hospital Association.